Very little information about this japanese computer. 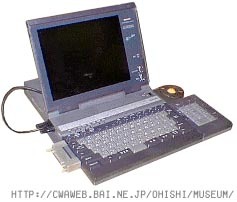 It is a PC compatible laptop. It has no floppy disk drive built-in but a 20 MB hard disk inside. It was also called MZ 8376 (Perhaps it is the last member of the MZ series ?). see more Sharp AX 286 Ebay auctions !